Montgomery County's been talking about building a sports and entertainment arena for a decade. Now, officials want to build it in downtown Silver Spring on the site of an aging parking garage. This underused parking garage could become a new sports and music arena. Image by the author. On Wednesday, county officials announced a request for proposals to build a 5,000-seat venue on the site of two public parking garages on Bonifant Street, one block from the Silver Spring Metro station. The county is looking for a development partner to build a hall on the three-block site, as well as housing, retail, and some replacement parking. This idea first emerged last year when the Wizards were looking for somewhere to build a practice facility. Montgomery County suggested building it on top of the parking garages, similar to the Capitals' practice rink in Ballston. The Wizards instead chose a site in Congress Heights. But county officials have been considering an arena for over a decade. A 2007 study looked at building an 8,000 to 10,000-seat venue in Germantown and said it would be successful, drawing a minor-league sports team, live concerts and shows, and hosting high school graduations, most of which are held at DAR Constitution Hall in the District. Five years later, two entrepreneurs suggested building a venue next to the Shady Grove Metro station. 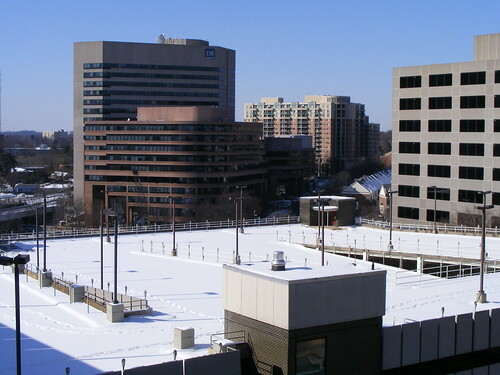 This Silver Spring site could solve two problems. Like many Montgomery County parking facilities, the Bonifant Street garages, which together contain nearly 1,800 spaces, were built in the 1970s and are aging. Meanwhile, 42% of Silver Spring's nearly 10,000 public parking spaces sit empty at all times (full disclosure: my company worked on a study of parking in the county) and are frequently closed to the public. As a result, county officials decided it may be easier to dispose of underused parking than to do expensive renovations. Last year, the county sold a garage at Colesville Road and Spring Street to United Therapeutics, which is building an office building there, while a parking lot on Thayer Avenue will become an apartment building with some public parking in an underground garage. A 5,000-seat music venue could fill a big void for concert halls in the DC area. It would be bigger than DAR, which has 3,700 seats, and a proposed 4,200-seat venue at St. Elizabeths in southeast DC. Montgomery County's largest indoor venue is the Fillmore Silver Spring, with room for 2,000. Meanwhile, the next largest venues are either outside, like Merriweather Post Pavilion (19,000 capacity) or major-league sports arenas like Verizon Center (20,000 capacity). It could potentially be a huge draw for downtown Silver Spring, which has drawn thousands of new homes over the past decade but has a high office vacancy rate. Like the Verizon Center for Gallery Place, more entertainment options would help draw foot traffic to the area's small businesses and retailers, particularly along Georgia Avenue and in the Ripley District, a portion of downtown Silver Spring that is pretty dead at night. That said, there are some big questions looming ahead. One is how the demand for a sports and entertainment venue might have changed since 2007. The live music industry is consolidating, and bigger concerts and festivals are struggling to sell tickets. Meanwhile, the area's smaller venues have had to compete for acts since the Fillmore opened in 2011. There are some interesting design challenges too. The parking garages bridge over two existing streets, Bonifant Street and Dixon Avenue, creating two gloomy underpasses that may discourage people to walk through to the other side. Removing these underpasses would improve connections to the surrounding neighborhood, but may not be possible depending how much space a 5,000-seat venue would need (it is, after all, a giant box). There's also the issue of how the venue would work with the Purple Line, which will pass through the site on Bonifant Street. Big arenas usually don't have a lot of windows or openings to the outside, meaning lots of blank walls at street level that can kill activity. On top of that, they're only busy when events are happening there, meaning the site could be dead most of the time. Ideally this venue will follow the example of the Verizon Center and have shops and restaurants on the ground floor that create activity regardless of if there's a game or concert happening. Montgomery County's been thinking about building a sports and entertainment venue for a decade. While this project may have gained some momentum, it'll require a lot more thought before the lights finally go up. At this rate, county officials say it may open sometime in the 2020s.